Sarcasm is hard to detect huh? There should be a specific font for sarcasm. /s is shorthand used to denote sarcasm. Great pk up. Let’s c what he had left tho. Why would you want to bring that cancer in to your locker room? hope prices the people wrong. I agree about Dak, 100%! Saints about to win the super bowl! I think he meant if the Colts are the opponents. Think an 11/29 showdown IN Dallas had anything to do with him being interested in the Saints? 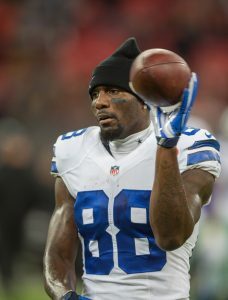 I think saints being 8-1 with only one notable receiver was a huge part, as Dez turned down money from the Ravens and Browns as he awaited either a contender or the Cowboys to come crawling back. Amari Cooper ended any dallas dream. I hate that the league has Thursday games but that one in Dallas will be worth watching. Cowboys probably have to sweep the 3 game home stand that starts on Thanksgiving Day to make the playoffs.